It's that time of year that Parents just love! (sense the sarcasm?) It may feel like you don't have time to add one more thing to your plate, but working on a science project with your kid can be lots of fun and quite the learning opportunity for your child. I know my son loves working on science projects. The great thing is that science covers such a huge range of topics, there is bound to be something you can enjoy doing together. While the actual experiment is the most important part of the science fair, I'm a big supporter of making your board look the best it can be. It doesn't really matter what you did if your presentation doesn't invite people to come look at it. 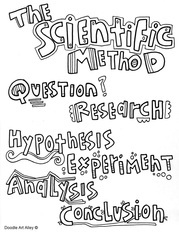 I created some Science fair heading coloring pages that you are more than welcome to use for your projects. They add a touch of color and whimsy.